Tonight, my husband took Hunter to the Virginia Tech game verses UVA and you better not ask who they were cheering for! We are Hokies in this house (if you aren’t, we can talk about that issue later). The girls packed lunches, signed papers, and got ready for bed! I kissed my babies, said their prayers, and tucked them into bed! I heard the timer go off and my salad was calling my name! It is now 8:45 at night, but I have my fast tempo run in the morning after meeting the house inspector at 7AM so this girl had to consume some calories! With 8 miles at 7-minutes a mile, you better have eaten the night before! I got a big dinner plate out and put a generous amount of arugula lettuce on the plate then topped it with roasted butternut squash I had made the night before (leftovers are the easiest!) and tossed some feta crumbles and, of course, had to put my walnuts on top! 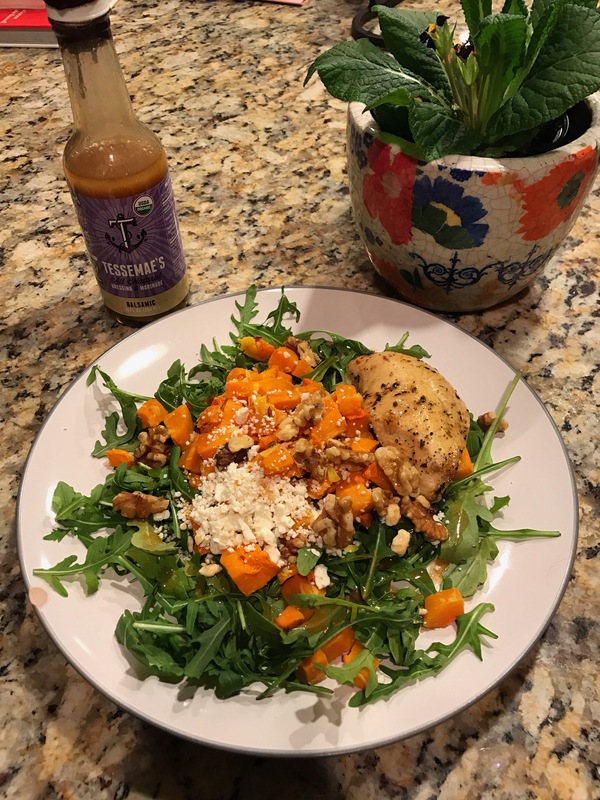 I am in love with Tessemae’s Balsamic Dressing I found at Kroger in the produce department (about $4.99). It is gluten free, and I can count the ingredients on one hand so that is always a good sign for me when I am picking something healthy. Plus, I can pronounce all the ingredients in it. (Thats the other way I gauge if a dressing or any food is healthy!) I don’t even look at the fat, because a little bit is all good for your body. My rule of thumb is only add 1 tablespoon to the salad so that you keep it low calorie and healthy. So with a drizzle of the dressing and a glass of wine this momma sat down to complete peace and quiet to eat the best salad of her life! I mean the best! Please make this and you will want one every night! Can you see that I loved it? !